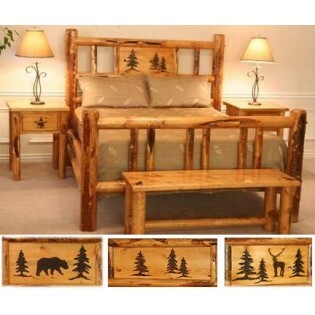 This rustic Rocky Mountain Log Bed is made from solid lodge pole pine with natural bark trim and features a center panel of hand carved trees. 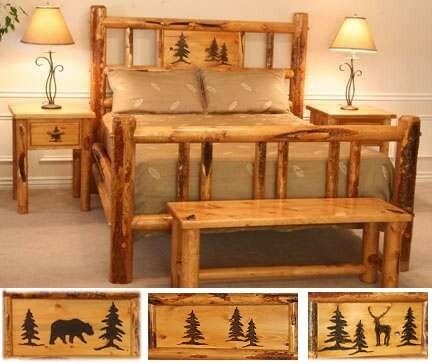 This rustic log bed is made from solid lodge pole pine with natural bark trim and features a center panel of hand carved trees. The Rocky Mountain Log Bed has 2 1/2" diameter logs that hold the box spring and mattress, under which are placed four log pedestals for additional strength and support. This will ensure that your side rails never break or turn. It is finished with an durable oak stain. This bed comes in 3 designs and can be purchased with a natural bark trim as shown or clean peeled.